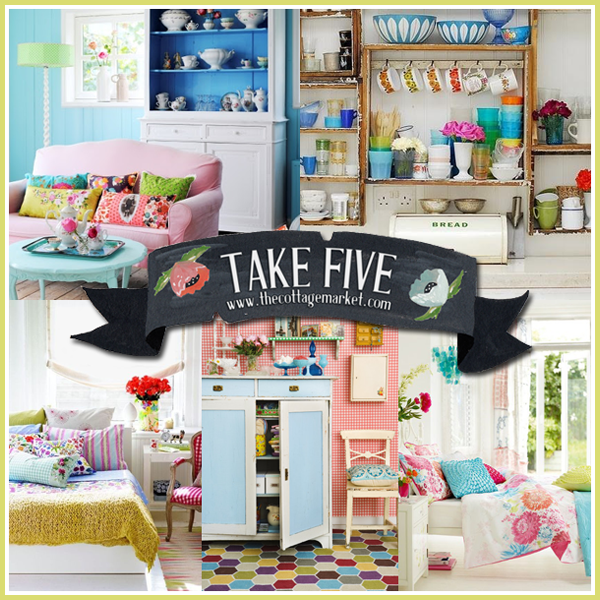 What is Take 5 you ask…well it is a collection of 5 things that I think you will all enjoy! It can be themed…random…food…crafts…home decor and everything in between. 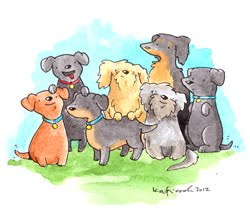 Hopefully you will love them enough to take 5 minutes out of your busy day… relax and enjoy! 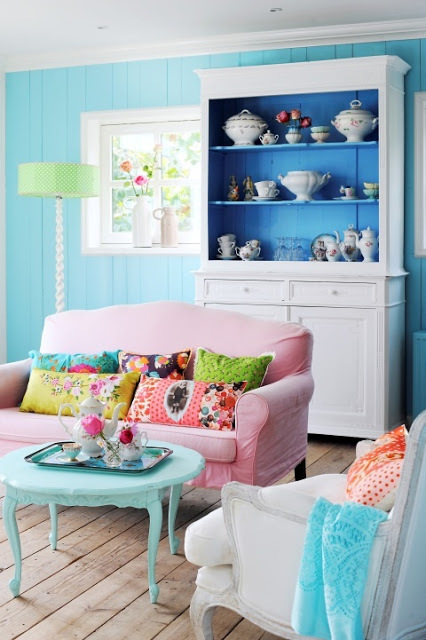 Today it is all about Cottage Fresh with a Burst of Color! Burst of color…not just a POP! 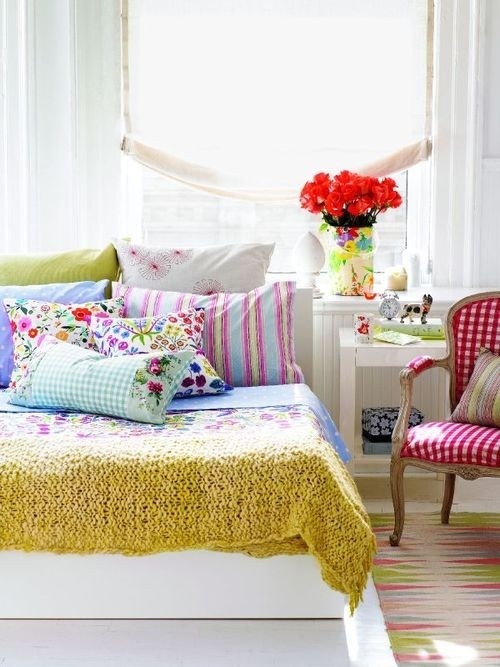 : ) Even if a lot of color is not your thing… looking at these room might inspire you to go color wild or maybe add a little bit! This fun display is going to make you want to get in your car and go find a Flea Market! How great do all of these vintage finds look when put together in a grouping…there’s no matching…just mixing and for some unexplained reason it works… pure fun and oh so very whimsical. You don’t have to go the full distressed look…you can use any shelving ensemble you would like in any color. Get all those goodies lined up and play with them…you will give a new and fresh look to Grandma’s favorite things! A simple bed…a vintage style chair…a mix and match array of pillow shams on a simple bed…fresh flowers and a crisp white backdrop…it all equals fabulous and fun! If you notice…the common denominator is a touch of red…red flowers in the vase…a few red blooms in the pillow print…red gingham and red stripes on the rug…it ties it all together! 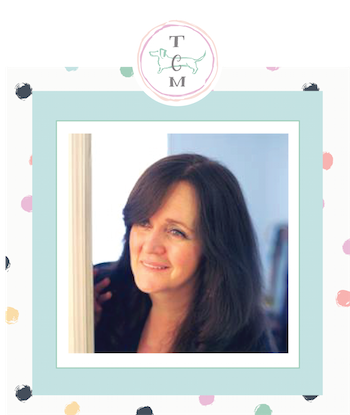 I have to be totally honest with you…I have featured this room before and I can’t help myself…I have to do it again…I simply adore this Fresh and Fanciful room and wouldn’t change a thing! It’s fresh…it’s crisp…it has a Cottage Vibe with a touch of Boho and the colors are yummy! Here’s another Vintage Cottage style space that has had fresh life breathed into it. The cabinet is freshly coated with a creamy blue and white chalkboard paint treatment and then surrounded with all of your favorite finds and treasures! I do have to say that I would have preferred a white wall but the check is still tons of fun! Vignettes are the way to go with all of those vintage pieces you have and collect…once again…play with them until you get it just the way you want…it’s worth the time for sure. ENJOY! Now for a BURST of Cottage and Color! WOW Factor! The pink couch makes me smile…the array of colors in the pillows is picture perfect! Oh and the floor looks like it was meant for this style for sure! Take a look and see what you like and maybe it will inspire you to take the pop of color jump…trust me…it’s fun! Now I just wish I had that exact couch and pillows! 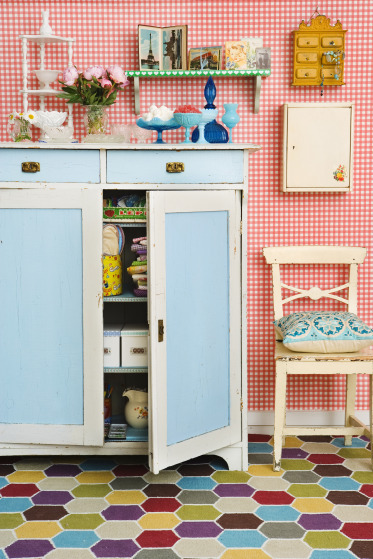 « Junkin Joe Upcyling Thrifty Finds Furniture Make-Overs and more great Features plus a linky party! ALL WELCOME! Each room is so colorful . . . bright . . . inviting. 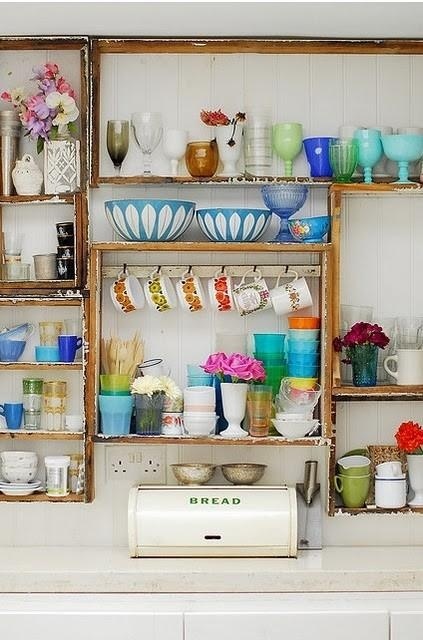 Love love love the colourful crockery!